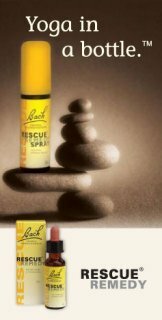 Rescue Remedy by Nelsons Bach Whether you're bringing home a new pet this season or just trying to calm down the ones that are already stressed out by guests, new no-no's, or just your own anticipation, there's a remedy to the rescue! Rescue Remedy Pets, which even Martha Stewart uses to calm her horses! 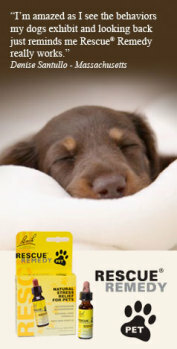 Rescue Remedy is a homeopathic blend of 38 floral extracts, all of which treat individual symptoms of stress. These same flowers are used in the preparation of Rescue Remedy Pets, but for pets sensitive to alcohol, this blend is prepared in an alcohol-free base. Rescue Remedy Pet by Nelsons Bach Rescue Remedy Pets contains beech, chicory, heather, honeysuckle, walnut, and water violet flowers among its 38 calming remedies. But each flower has a specific purpose. For example, dominant dogs would benefit from the vine flower included in this blend, but would probably benefit as well from the holly flower which is de-stressing for jealous dogs. Horses pick up moods very easily from their owners and may be sad, sometimes due to a loss of a companion horse. Clematis, elm, gentian, honeysuckle, wild oat and wild rose extracts in Rescue Remedy would be helpful to both horse and owner. Cats who experience nervousness around visitors and those who've been abused or terribly frightened could benefit from mimulus, rock rose, star of Bethlehem, and water violet, among other ingredients in Resue Remedy should be eased. Nelsons Bach recommends the dropper format, as it can be applied in the mouth, on the nose, in the ears, or in pet food or water. The company claims it is suitable for all pets, even reptiles and fish. Are Your Dogs Laughing Their Tails Off?